Lucy and Ethel dress like twins. The Two of Wands recognizes that some things are just better done with an ally: someone to watch your back or give you a hand or provide feedback for your ideas. Someone to share the blame when you get in trouble, or the credit when things go right. 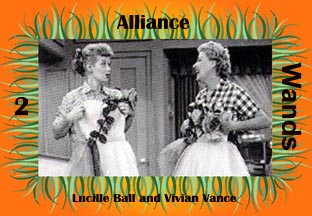 Lucy and Ethel were dressing up The Lucy Fanatic WebPage!